Posters and T-Shirts have become essential political tools for political rallies such as Tea-Parties, Town Halls and 9-12 Rallies. In addition to hand-made signs, the display of artistic posters and T-shirts at Tea Party, Town Hall, and 9-12 Rallies help convey important political messages and themes. Posters and T-shirts that are eye-catching and clever without being offensive can help overpower the inevitable presence of offensive posters because in a free country it's virtually impossible for responsible citizens to prevent irresponsible people from attending large events and displaying offensive material in doing so. The greater the number of inoffensive hand-made signs and artistic posters and T-shirts, the greater the effect of overpowering the presence of a few offensive posters, signs or t-shirts. 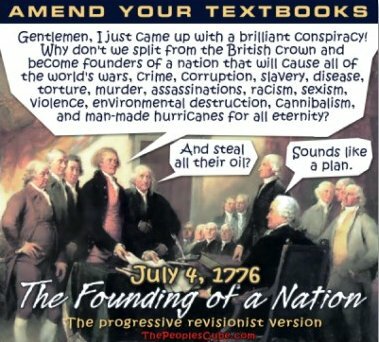 Pre-Existing Condtion of "Tea-Party Syndrome"
This leads to the question, "What do you mean by 'offensive' or 'inoffensive'?" To understand what I mean by "offensive," click here or scroll down to view that part of this commentary. To illustrate the kinds of signs/posters/T-shirts I think are not offensive, I've included in this commentary descriptions of (and links to) illustrative examples. I've also included displays of (and links to) several examples (one of which are mine). The example at the right mocks ObamaCare supporters' attacks on ObamaCare opponents for pointing out that ObamaCare supporters made false claims about the nature, scope and time of implementation of prohibitions against insurance companies denying coverage for pre-existing conditions existing at the time applicants first apply for coverage-- i.e., the equivalent of condemning fire-insurance companies for wanting to deny coverage for a fire already raging at the time the applicant sought to obtain fire insurance for the property already being consumed by fire. Given the pedal-to-the-metal attacks by ObamaCare supporters on ObamaCare opponents for exposing false claims by supporters, this poster makes it clear the kind of "pre-existing condition" to which "ObamaCare" would apply as well as an illustration of the kind of political "treatment" ObamaCare would offer to persons "afflicted" with such "pre-existing condition"-- i.e., the "tea-party syndrome." The "Enlist in the IRS" poster to the left draws attention to the fact that ObamaCare designates the IRS as the agency to enforce the ObamaCare requirement that everyone acquire "health care" coverage approved under criteria to be promulgated by faceless federal bureaucrats. 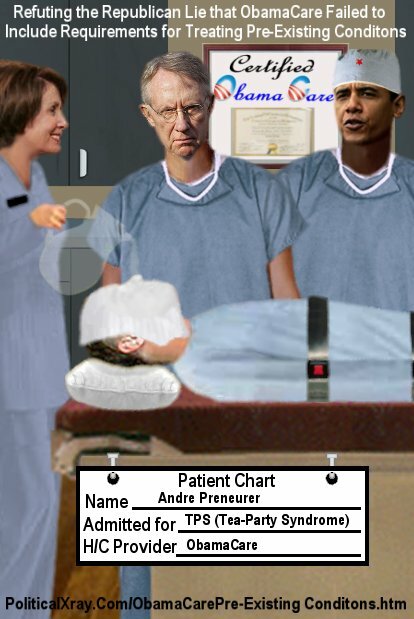 This aspect of ObamaCare ought to bury the needle on the anger meter of anyone who values freedom. It's mind-boggling that we've reached a point in America when political leaders think it's constitutional for the federal government to dictate to private citizens the type of "health-care" insurance they must acquire. In contrast to Bush 43, who dismissed unrelentingly hateful and violence-inciting attacks on him as "free speech," the Obama Administration is as thin-skinned as any other group of leftists, progressives, Marxists or socialists. They attempt to demonize opponents and critics as "haters" and "bigots." And the Obama Administration is not simply waging political warfare against critics, it's also waging an unrelenting "moral" crusade against "profit" and "corporate" America. Even worse, Obama considers the American constitutional concept of imposing limitations on government in favor of individual rights to be flawed because it "fails to say what the government must do for you," which comments you can hear in his own words here. Perhaps the greatest threat to freedom is empowering government to do "good," which encourages empowered officials to view their powers as boundless and to view recalcitrance of their "subjects" to bend their behavior towards the will of the leaders as subversion. Few people can understand this as well as those who have lived under such a system. One such person is Oleg Atbashian, who emigrated from Ukraine to the United States shortly after the collapse of the Soviet Union. 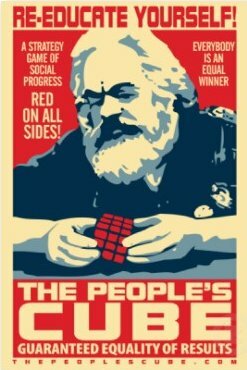 His website, which is one of the most popular on the internet, is ThePeoplesCube.Com, which depicts how collectivists view themselves and the sweating masses for whom they feel contempt while nevertheless professing boundless compassion for them. Today, April 1, 2010, is the five-year anniversary of the Cube. Oleg also writes for the Pajamas Media. He's written extensively about how the trends in the United States are taking us in the direction of the statist system from which he so gladly departed for freedom in the United States. Anyone who knows Oleg knows that he understands American culture and American history far, far better than a large majority of natural-born American college graduates today. As one who has been privileged to be his friend, I stand in awe such knowledge and insights on his part. Obama's "apology" tour set a record in blaming the greatest number of the world's problems on the United .States. It was stock, off-the-shelf, leftist, progressive propaganda. He utterly failed (until his speech accepting the Nobel Prize-- for which I gave him credit) to give credit to the United States for having been the most stabilizing force in the world against tyranny for the second half of the Twentieth Century. I also give him 3/4 credit for having made a 3/4 correct decision in providing General McChrystal 3/4 of the number of additional troops he requested for Afghanistan. I give him credit for what appears to have been an increasingly effective utilization of Predator drones over Pakistan and Afghanistan to hasten jihadist leaders' appointments with "72 virgins in heaven." But he remains most sensitive to his opponents' characterization of his political philosophy as fundamentally socialist and Marxist in nature. Why is he so sensitive to such characterization? Because, as the old saying goes, the truth hurts. He (like most on the American left) thinks socialism failed in the Soviet Union simply because it wasn't done well rather than because it's a fundamentally flawed political concept at war with the very nature of freedom and liberty our Constitution guarantees. He and they are utopian socialists at heart. Another form of utopianism he and the left embrace is what I first termed "pantheopianism" back in the year 2000. "Pantheopianism" is the worship of nature (pantheism) with the zealotry of utopians-- hence, "pantheopianism." It's the religion of Global Warming masquerading as "indisputable science." But what they contend to be beyond scientific debate is nothing more than the basis for their crusade for leftists/progressives/Marxists/Socialists to prescribe down to the most mundane detail how the sweating masses should lead their lives. 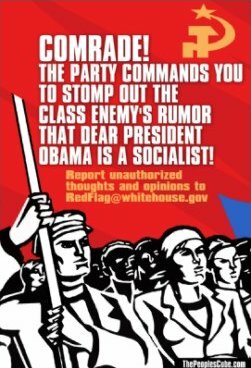 Of all the activists on the scene today, it is Glenn Beck whom I credit most (despite important issues on which I disagree with his conclusions) for exposing the leftist/progressive/Marxist/collectivist/socialist/statist mentality that pervades the entire Obama Administration. Most of such exposés by Beck involve audio and/or video of Obama and/or his officials or associates in their own words. In recent years, liberals became reluctant to be politically identified as such not because they weren't liberals but because the label had become politically toxic even though such term correctly described their political philosophy. 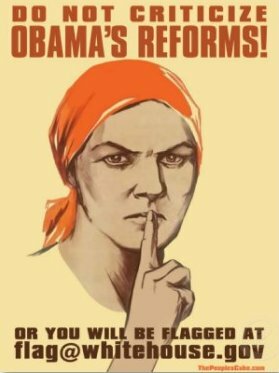 The same is true of the Marxist/socialist/statist/collectivist philosophy embraced by Obama and many with whom he surrounds himself or with whom he associates or from whom he seeks advice and counsel, yet they all attempt to treat such accurate characterizations of their political philosophies as "hate speech." That's because they know that not only are such terms politically toxic but that the political philosophies they hold are likewise politically toxic unless they are able (through their sympathetic friends in the news and entertainment media) to mis-label such philosophies as mere manifestations of a compassionate liberalism or progressivism. 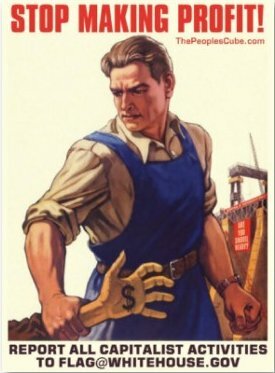 Finally, to illustrate what I mean by "offensive," this commentary does not display, or provide links to, such posters/T-shirts (and some don't even have the decency to wear t-shirts). Instead, it provides links to sites which display them for the sole purpose of identifying them as examples of offensive signs/posters/T-shirts-- For examples, go here (to see the hate-themes of the left, scroll-down past the pictures from the recent tea-party rally in Harry Reid's home town of Searchlight, Nevada).